feeling listless -- "Poverty of goods is easily cured; poverty of the mind is irreparable." 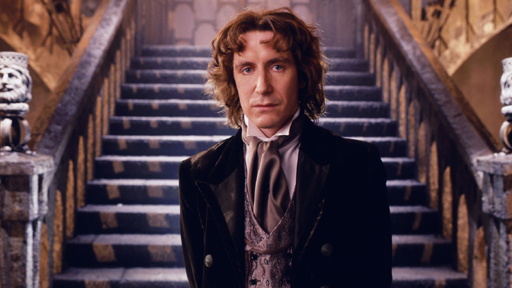 feeling listless: A Chronological Checklist to the Eighth Doctor (a work in progress). A Chronological Checklist to the Eighth Doctor (a work in progress). TV Having recently completed the decade long business of reading, reading and listening through the mainstream of the Eighth Doctor's adventures and posting reviews, I thought I'd put together something which links to all of those reviews which could also double as a chronology should anyone decide to try and repeat the exercise. Good luck with that. As you'll see from the linked the dates, the novels took almost as long to read as their original publication history. As I explained in the barebones version a few years ago although there are a number of chronologies available (and I'm grateful to @girlfromblupo for pointing me to this one) many of them tend to mix the various media together. My own version keeps things simple and has the books then the comics then the audios since they're all relatively self contained, especially since Big Finish decided to create a whole new character to explain the reference to Sam from Minuet in Hell. In the process of completing all of this, there is still a lot of material which I've missed so for the purposes of fannish completism, I'll be enjoying my way through those too and I'll add them into the main trunk of the list once they're reviewed where I think they should be (just to add to the challenge), as well as anything new which is published. Some of the prose is about audio and comics characters so they'll be more obvious. We'll see about everything else. Finally quick word about format. Anything which isn't in italics is original publication history. Anything in italics was produced after the fact and I've added extra information in the brackets afterwards to explain what it is. Originally, I did have lots more gaps to delineate "seasons", but decided in the end to just separate the more obvious runs of continuous narrative (which then runs aground with Dark Eyes which is a sixteen adventures, four adventures and a single one altogether). Organism 96 (Tales of Terror). The World Beyond The Trees (Big Finish Short Trips Audio). The Forgotten: Revelation (IDW Comic Issue #5). The Diary of River Song: The Rulers of the Universe. Dead Man's Hands (IDW Graphic Novel). The Lost Magic (Twelfth Doctor Audio Original). Here's everything which will be moved above and nudged into place once I've read, read or heard them and posted the necessary paragraph. Do let me know if you think I've missed anything. Updated 28/12/2015 I've added The Diary of River Song. The Titan limited series, also set during the Time War is out but I'll post a review of those when the series is finish and add them to the timeline then in case there's something which indicates how close they're set to the regeneration. As I've said elsewhere, the Time War era sounds like it's going to be populated without a clear narrative order unless someone decides to attempt to official apply one. Most likely it'll be like the Baker era between Trial and his regeneration or in Big Finish terms between their ongoing (currently Doom Coalition) and Night of the Doctor. Updated 15/01/2015 After Foreshadowing, The Elixir of Doom and Bounty (and Klein's Story although that's an alt.Eighth), I'll be hitting the subscriber wall on the audios. The three short stories and The Four Doctors are only available if you sign up to various subscriptions at Big Finish and money is unfortunately an object right now. Copies of The Four Doctors do turn up on eBay now and then, but £30 is still a bit steep. Availability of these old stories is going to be a huge problem going forward especially in the hard copy Short Trips. Expect updates to become sporadic. Updated 21/01/2015 I've added a Miscellany section for alternative non-canonical versions of the Eighth Doctor. Updated 04/04/2016 Not that Titan's Eighth Doctor comics series is completed, I'm all caught up with the Eighth Doctor's canonical comics adventures. Unless I've missed something. Updated 08/06/2016 The Four Doctors, Doom Coalition 2 and The Curse of the Fugue all added which means barring those pesky three subscriber specials and the reading of Bounty I'm all caught up audio wise. Oh and Klein's Story. Oh. Updated 06/11/2017 Add a new category, Almost, but not quite, entirely unlike the Eighth Doctor, for stories featuring a version of the character from outside the main continuity: from alternate realities or degenerative cameos, that sort of thing. I am so amused you included the pornographic Black Lace story. Doctor Who in the British Movietone Archives. My Favourite Film of 1989. We Need To Talk About Hank Pym. The Omen of Sefton Park. Ayesha Dharker on Queen Jamillia.